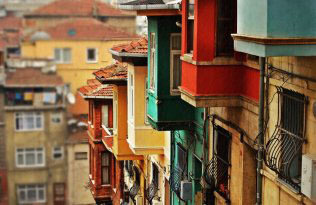 Istanbul is a huge city which is growing at very fast pace and constantly changing in an almost uncontrollable way. It has historically had many problems in terms of urban, cultural and social issues because of continuous immigration, but the biggest problem is certainly given here: Traffic. The main difficulties need to be addressed to solve the problem are essentially geographical. The city is divided not only by the Bosphorus, but also by the Golden Horn. It is spreaded over several hills, so the steps to avoid the obstacles are limited. At rush hours, it is quite normal to spend half an hour in the car and drive only a couple of miles. Obviously everyone agrees on how to solve the problem: improve public transport. And you have to admit that there is progress with some significant steps forward over the past five years, but generally it is still far from the resolution. In Istanbul, unfortunately, much of the public transport is based on buses. The subway is still very limited although there have been many investments in this direction in recent years such as doubling the miles of the only existing line and proceeding the construction work on three new lines. Even the archaeological discoveries on the construction site of the Yenikaı line affect the process. The tube tunnel passes under the Bosphorus (Marmaray Project) has been blocked for the same reasons. It is decided to open a new museum just inside the place, after all. For tourists who are visiting Istanbul, it can certainly be a problem to understand the organization and structure of the transport system. It is also hard to read the varied prices, choose from the many differerent types of transportation available, evaluate the differences and peculiarities, etc. Istanbul is a city that can be explored on foot, but considering the distance, if you decide not to use any types of transport, it could deprive us of visiting many important areas. Therefore, we decided to classify all public transportation, describe the main features and provide all the necessary information for you. To make the discussion as clear as possible, we will refer to the map given at the beginning of the article. You can simply click on it to increase the size and save it. Bus: By all means, it’s the most used public transport by the locals and also by us by far. It has a very extensive network covering the entire city from Beylikdüzü in Pendik. On some lines, the connections are so frequent that a bus is almost every minute. They are mostly in operation until midnight, but for some routes they are available 24 hours. There are various types of buses in Istanbul which have different colors like; the Municipality color: white-red (the older ones), green and yellow (most modern ones) and purple (recently introduced eco-friendly ones). The blue buses are half- privatized, but fully integrated into the public system and implement the same rates with the others, so passengers will not pay any extra. Normally, buses are not the most popular way of transport among tourists, because it is not always easy to find your way between all those stops and more importantly they don’t go to Sultanahmet area which is the main touristic place. But if necessary, it would be so useful to beat the initial distrust. The main terminals are to considered to be Eminönü, Kabataş, Taksim, Beşiktaş and Kadıköy. If you have no idea about in what area of the city you are in, you can simply find the closest bus stop and get on the first bus to Eminönü or Taksim and come back to the city center. The company responsible for the circulation of the Municipality buses is IETT. Subway: There are currently only three active rail line as indicated in our map with the symbols M2, M3 ed M4. The M2 line is certainly the most interesting for tourists, since connecting Taksim with the historical peninsula, passing over the Golden Horn, thanks to the newly opened bridge. It can be useful because it connects the district of Beyoglu and Sultanahmet (the stop is Vezneciler, not far from the Grand Bazaar). The line continues south to Yenikapı, while to the north towards the financial center of the city, in the area of Şişli and Levent. The lines M5, M6 ed M7 are currently under construction. Subway operates from 6 o’clock in the morning until 24 o’clock. Metro: It is currently the only active line indicated by the abbreviation M1 on the map, on the map. It runs both underground and on ground between Aksaray and Istanbul Atatürk Airport, so it is a very convenient and cheap way to travel from the airport to the city center. Another stop on M1 that might be important for tourists is called Otogar (Big Bus Station) where buses depart for all destinations in Turkey. Operates from 6 o’clock until 24 o’clock. Tram: It is modern, functional, fast and punctual (leaves almost every 5 minutes), also handy for people with disabilities or wheelchairs. It is structured on a single T1 line that passes through Sultanahmet and connects many of the important destinations, so it is definitely recommended to use. The two terminals are Kabataş and Bağcılar. At Zeytinburnu station, you can make a transfer to M1 line that leads you to the Istanbul Atatürk Airport. Operates from 6 o’clock until 24 o’clock. The company responsible for the circulation of the metro and tram lines is called Istanbul Ulaşım. Tünel: The second oldest subway in the world which was built in 1875. In fact it is a clearly modernized underground funicular which connects Karaköy and the Galata area. Indicated on the map by the initials F2 it is very convenient to reach Istiklal Street quickly when you are near the Galata Bridge. While it feels good to avoid that strenuous climb up the hill, you don’t have to take F2 on the way back from Istiklal, because it takes only 5 minutes down the hill on foot. It operates from 7 am until 22:45. Funicular Kabataş-Taksim: Denoted by F1, It’s the second underground funicular in Istanbul which was opened in 2006. It connects the Kabataş hub (Terminal station for T1 trams an also important port for ferries) directly to Taksim Square in less than 2 minutes. Operates from 6.15 am until 24. 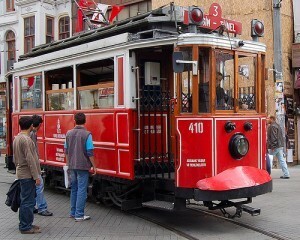 Nostalgic Tram: This is not only a colorful but also a useful tram (T5) that runs istiklal Caddesi for all its length, starting from the Square and coming up to Tünel area. You could use it either to take some nice pictures, or beat the flood of people on Istiklal Street if you are in a hurry all along 1,5 miles from one end to the other. In the last ten years, there’s a twin tram (T3) runs a loop in Kadıköy district on Asian side. Operates from 7 am until 20. Metrobüs: A temporary solution for the traffic jam, but still effective in a way. It ‘s just a bus traveling on a highway in the middle of the road, so there is no traffic (MB). Implements a long route between Asian and European sides from east to west and serves mainly for commuters, therefore not very useful for tourists. MarmaRay: Much has been said about the new tunnel under the Bosphorus: the MarmaRay Line infacts connects the European side and the Asian side of Istanbul with an underwater tunnel. For tourists actually its use does not appear necessary, since wanting to visit the Asian side is definitely most impressive to reach it in 15 minutes by ferry. Also coming from Sabiha Gökçen Airport on the Asian side, are certainly more functional and quick other solutions. Cableway Eyüp-Pierre Loti: It connects the Eyüp Port on the Golden Horn to the panoramic Pierre Loti Café. Operates from 8 am to 22. Ferry: Ferries in Istanbul (vapur) are widely used, especially by those who work on the European side but dwells on the Asian side, or vice versa. It’s the best way to move from one side of the city to the other, and also to enjoy a short Bosphorus trip with just the price of a regular ticket. The main two docks on the Asian side are Kadıköy and Üsküdar, while the main European side ports are Eminönü, Karaköy, Beşiktaş and Kabataş. Departures are very frequent and time tables can be viewed on Şehir Hatları (the company of municipalities). Also, important to remember that you can easily reach the Princes’ Islands from Kabataş or Kadıköy with 8 daily connections. In addition to Şehir Hatları ferry service, there are also two private companies integrated to the public transport system: Dentur and Turyol. First of all, we will inform you about one thing: There is no subscription to public transport, neither daily nor weekly. There is only monthly subscription (Mavi Kart), however, reserved only for Turkish nationals. Foreign Erasmus students can buy a special card for students with special rates, though. On many of the public transport so far mentioned, you can use the red plastic tokens (jeton). The cost of a token is 3 Lira and they are easily accesible at many machines or kiosks close to tram, metro or ferry stations. 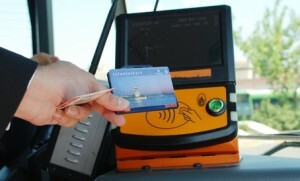 The operation is simple; you insert the token and pass through the turnstiles. Be careful about one thing, though: The ferries can’t use the tokens which are valid for trams, or vice versa. However, there are some exceptions. the most important one is related in buses. When you want to take a bus, there are no turnstiles and you can’t use the tokens. Therefore, we must necessarily buy an electronic ticket (also valid on all other public transport in the entire city), but that comes at a price of 4 lira for one ride. It costs a bit more than a token, you can also buy a valid ticket for two rides for the 7 lira, for five rides for 15 lira, or 10 rides for 28 lira. The same rules apply even for the Metrobus and for the nostalgic tram. For the suburban train, you can get an actual paper ticket in the station in addition to the e-ticket. Our advice for you to get an Istanbul Kart which has been used as a top up card for all public transport since 2011 and has gradually replaced the old Akbil(Smart tickets). 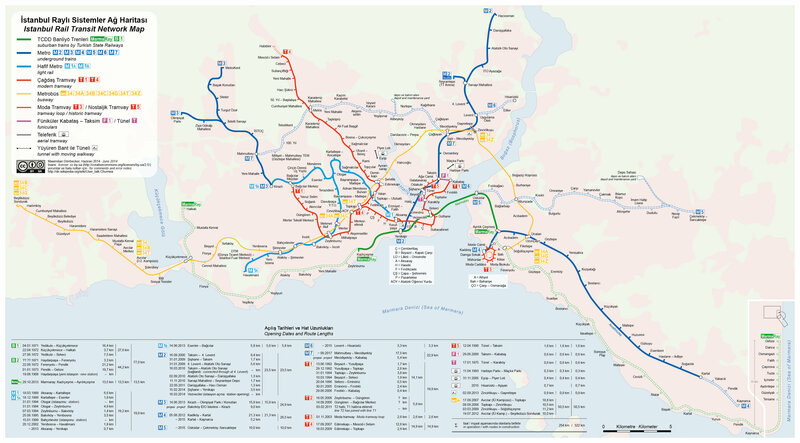 Using the Istanbul Kart will save money, because you pay 1,95 lira for any public transport. In addition, each time you make a transfer from one vehicle to another (for example, if you take a bus and a ferry afterwards, or if you take a ferry soon after you get on a tram), you pay 1.25 lira instead of 1.95. And it is possible to make 5 transfer in 2 hours. The Istanbul Kart is quite convenient because it is valid for an unlimited time. It theoretically lasts forever after paying a 7 lira deposit. Just remember, before you leave the country, you can return the card and get refunded (The credit that remains on the card won’t be refunded, though). Obviously it is not necessary to get more than one Istanbul Kart even if you are travelling with a large group. You only need one card since you can top up anytime if necessary. Istanbul cards can be found at all the kiosks and vending machines at tram stops, metro, bus and ferry stations and also Istanbul Atatürk Airport. You just need to touch it the turnstile sensors and wait for the confirmation beep. Recharges easily at the same kiosks and vending machines where you buy the cards. Some of the bus and ferry service fares are higher. For example, ferries to the Princes’ Islands and any buses crossing the Bosphorus Bridge apply double rate because of the longer distance they they make. 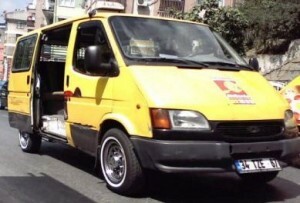 Dolmuş: There are mini-buses that have the function of collective taxis throughout the country. They depart one after another as soon as all the seats are taken: The word “dolmuş” means “full”. The most typical ones are; the yellow ones with a capacity of 8 passengers and the light blue ones with a capacity of 15 people. The most popular destinations are Kadıköy-Taksim, Taksim-Beşiktaş and Beşiktaş-Sarıyer. They are in service almost 24 hours. Taxi: Istanbul is one of the cities with the highest number of taxis in the world. It is actually a common way of transportation for not only tourists, but also the locals themselves since the rates are actually affordable especially if you are with a group of 4 people. The basic rate is 2.5 TL + 0.16 TL per 100 meters. However, the taxi drivers in Istanbul are famous for ripping off foreign tourists in a truly shameless manner. Be careful with that. As a common problem, if the taxi driver is not honest, he could drive you around for an hour and bring you back to your starting point again. It is also advisable to negotiate the price in advance, but do not shoot random numbers! We have happened to hear that some tourists are delighted to have negotiated a rate of 25 lira for a destination that would actually cost half the price! So, you must know that a standard ride from Sultanahmet to Taksim, or Ortaköy to Taksim should cost around 12-15 lira. If they want to charge you 50 lira for a 7-8 km. ride which should cost 25 lira in the middle of the traffic jam, then don’t pay and say you will call the police! 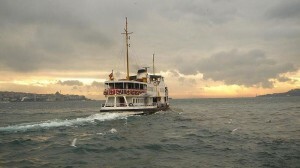 Sea Buses (Deniz otobüsü): The company IDO make fast connections within the Marmara Sea like Yenikapı to Bostancı (European to Asian sides of the city), Princes’ Islands, Bandırma, Bursa, Yalova, Marmara Adası and Avşa Adası. Fares and timetables can be viewed on IDO website. All for now, we have tried to shed light on a complex issue and we hope that we have been useful. For any questions not clarified by our article, you can leave your comments and we are here to help you! Clear and exhaustive infos. Thanks.